The Monday Group make sure their name is known, so that walkers know who to report to! Harold at the entrance to the workshop which is kindly loaned to the Monday Group free of charge! Harold Rowling MBE has spent every Monday since 1961 making the country footpaths of Sussex accessible. 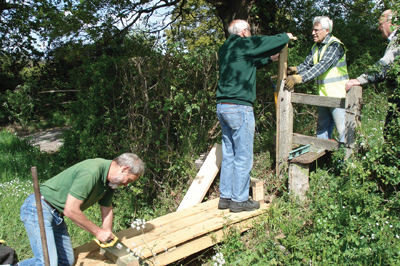 Harold founded the Monday Group 51 years ago to give walkers access to the many legally recognised footpaths in the area by building and installing wooden stiles and occasionally bridges. 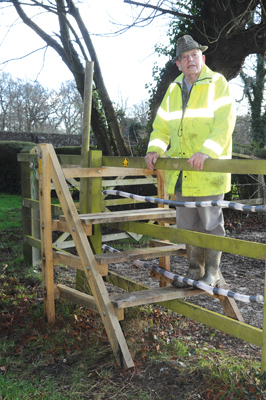 Now in his 90s - though you certainly wouldn't guess it - Harold still runs the 35-strong volunteer group and actively partakes in the work, from the designing of stiles to their installation and maintenance. We spent a wintry Monday morning with Harold and two of his team to see them at work. Harold was an RAF Engineer Officer during the Second World War. 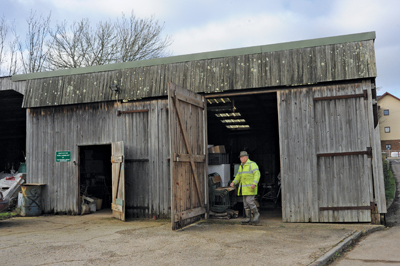 He was stationed first at RAF Stoney Cross in the New Forest, a quiet base where, he recounts, two Police Inspectors once turned up enquiring whether they had any horses. Thinking they had said 'Horsas' - the Airspeed Horsa, a wooden troop-carrying glider - Harold replied obligingly, "Yes, in the crates." Somewhat confused, the policemen followed him into the hangar and upon his opening a crate to reveal a wooden glider, it became clear that these servicemen were not guilty of smuggling horses from France! "Occupying troops were known to take their pick, they say every unit would look for the nearest grand piano!" Harold remembers. For the latter part of the war, Harold was stationed in India in preparation for conflict with Japan. The Horsa fell victim to the elements in this hot climate - Harold once found his glider in the hangar with its wooden wings unattached on the ground beneath it; the casein glue holding the wings to the fuselage had been eaten by termites. From then on, gliders were kept in their crates until the offensive began - once the order was given they would need to be assembled and airborne within a few hours. The ways in which we encounter woodwork are numerous, and in Harold's case, it had life-or-death implications. When Harold returned from service in 1946, nature had taken over the bridleways in the South Downs area while the country was committed to the war effort and many footpaths were closed, leaving most, if not all of the public throughways unwalkable. By the mid-1950s Harold had begun some clearance work in the countryside, but it wasn't until 1961 that the Monday Group was officially formed. Originally, finance was a problem; the aftereffect of the war could still be felt, and second hand timber was all that was available, "We could only get Japanese oak (Quercus mongolica), it was rotten stuff!" Harold says, but he has always insisted on using oak for its hardness and durability outdoors. 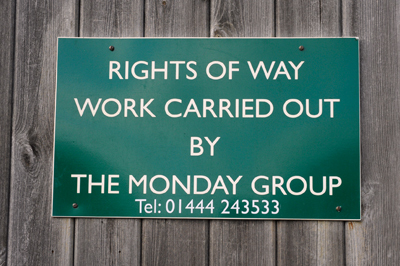 One early member of the Monday Group, Reg Adsett, was a postman, and his many contacts in the community helped to raise local interest in the Monday Group - kind donations from the public helped in those early days, and indeed are still important today. 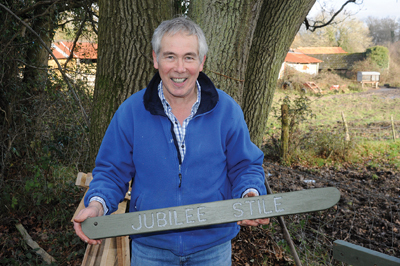 In recent years, the Monday Group has raised increasing amounts of money thanks to the work of stile maker, Jim Edwards. 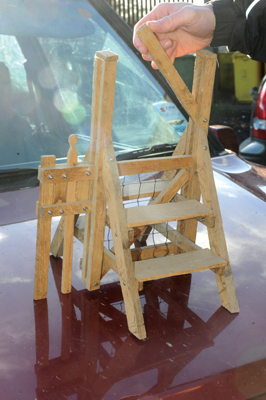 While Harold still thinks up stile designs - now up to the 'Mark 21' model - he no longer makes the stiles himself, leaving most of the making to Jim, who previously ran a commercial furniture business and is now retired, as are all of the Group's members. "His workmanship is of a very, very high level. 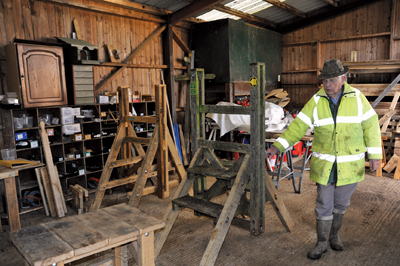 I'm quite happy for people like Jim to make their own modifications to stile designs as they wish" Harold points out, "Sometimes I think, 'Hmm, I wouldn't do it like that!' But I have no problem with members making stiles in their own slightly different ways." The stile making operation is roughly divided into two self-regulating groups; while Jim enjoys making his stiles from home, the other half of the Monday Group, led by Barry McMenamin, upgraded two years ago from their own garages to the Monday Group's dedicated workshop - a farm building set within the grounds of the beautiful St. George's Retreat. 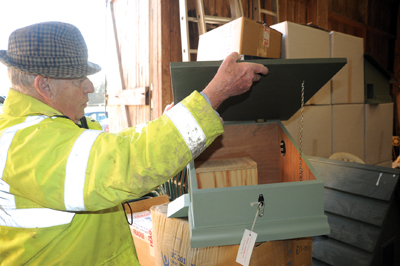 On top of making stiles, Jim also makes bird boxes, bat boxes and hedgehog boxes from offcuts, which he and Harold sell at craft fairs and other shows on weekends throughout the year, providing further income. These days, the Monday Group use English oak (Quercus robur) exclusively, "All of the oak we use is not just English, but Sussex oak! It's so local we can go and see it grow in Balcombe Forest," Harold informs us gladly. 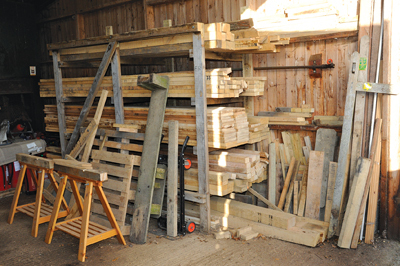 Each stile costs roughly £150; that covers the wood, which is unseasoned, and the metalwork, as each stile requires many coach screws and washers, and is anchored with angle irons. As well as donations, the public aid the Monday Group by informing them of areas where stiles are damaged or absent. The Monday Group then use the Definitive Map - a scaled-up Ordnance Survey map that shows all the legally recognised paths - to determine the best location for the structure. 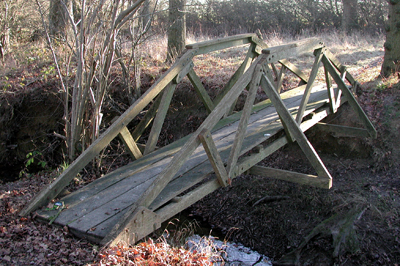 After communication with the landowner and Highway Authority if necessary, they decide on the particulars of the stile to best suit the location. There is a clearance branch of the Monday Group formed mainly of ladies who carry out work to make the paths themselves passable - stiles aren't of much use if they lead into overgrowth! 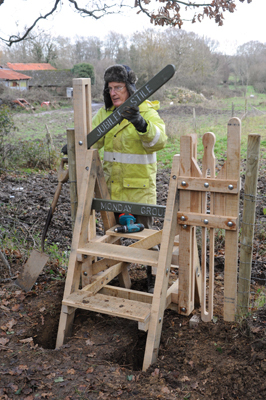 There are three general considerations when making a stile - it must be easy to use for walkers of all ages; stock-proof to ensure the farmer's livestock can not get through; and easy to install and disassemble for maintenance if and when needed. 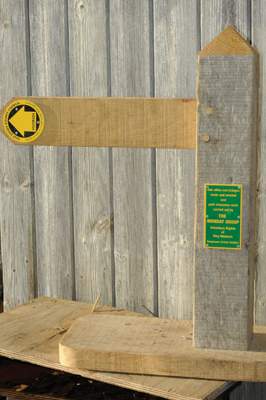 The Mark 1 stile was a simple farmer's dog-and-stick design, but now the Monday Group commonly install the Mark 20, which has a lifting top bar to aid the walker by eliminating the need to swing their leg over the top, the maximum step height is around 300mm, and a cutout through the centre of the dog pole makes it less heavy to lift. 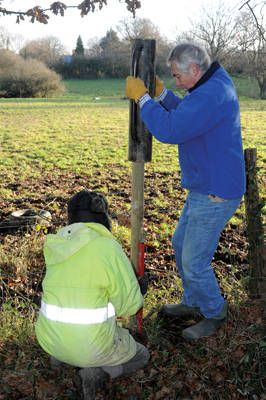 The posts between which the free-standing stile is installed are driven into the ground using a post driver and the stile is reassembled having been brought to the site dismantled; bolts are used rather than nails to make future maintenance easier. A level is used to ensure the crossbars are flat to prevent torsion in the long run, and a further diagonal brace reinforces the structure. Holes are dug in the ground and angle irons driven in for support. 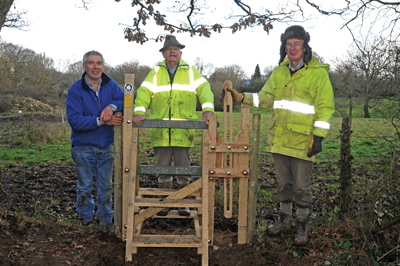 Harold usually revisits the stile after it has been installed for a winter to see if any action is needed, but generally the Monday Group's agenda is formed by the information gathered from members of the public. The Monday Group's members come from all walks of life, and Harold tells us that very few of them come into the group with any real skills or training in woodwork or DIY; "For many people who join,"he says, "even the idea of using a spirit level is alien! One of the attractions of the Monday Group is that people who worked as, say, bank clerks or insurance salesman can finally do something with their hands. 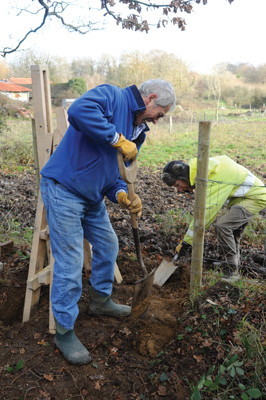 By the end of a morning's work a volunteer will have achieved something which can last for 25 years, and that's very rewarding." The group is split into teams of three or four, who are scattered throughout the area every Monday seeing to various tasks: â€œMyself, Jim Edwards, Giles Dickins and Tom Walker, who could not be present today, are one team. While we work we're always talking, joking, agreeing and disagreeing; we all come from different backgrounds - I'm an engineer by profession, Jim ran a furniture company, Giles was a schoolmaster, and Tom is an artist, he has just written a book about the Monday Group, which is available from our website. There are mixtures of people which never would have happened without the Monday Group.â€ Harold explains, "At first it used to puzzle me, I thought 'Why do people come out here every week in the cold, wind and rain?" And after a while it dawned on me how important the social element is. It's also a great way to keep active and keep learning - I'm still learning through the Monday Group all the time, even after 51 years." Watching this team assemble a stile at a roadside fence, it was clear from their good-natured joking and bantering that the social aspect is half the appeal of turning up every week, whatever the weather!